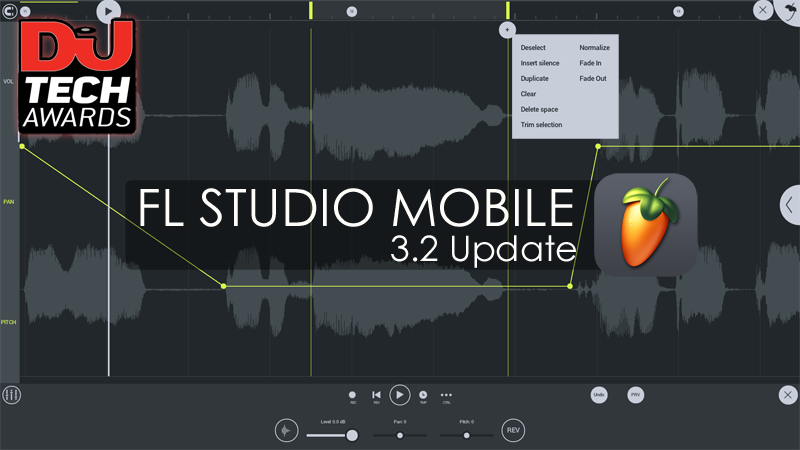 FL Studio Mobile 3.2.19 is now available for (Android, iOS or Windows). This update focuses on Time Signatures / Steps per beat. 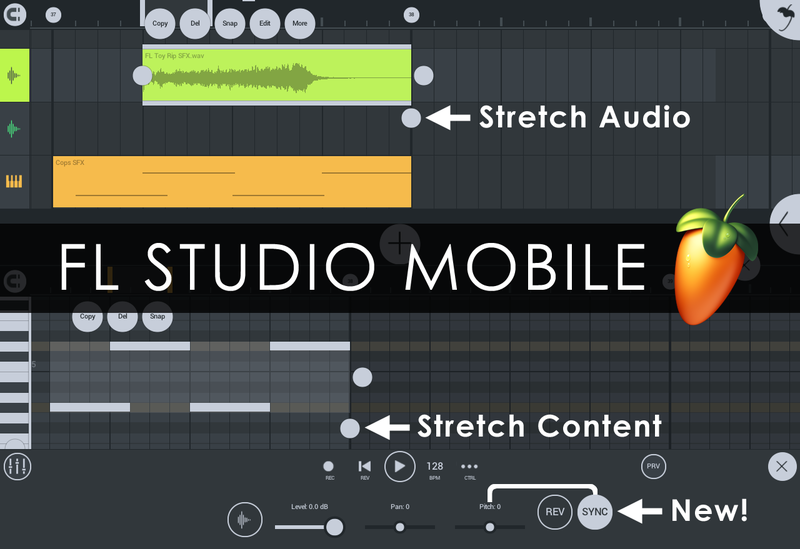 Watch all the FL Studio Mobile tutorial videos here. Time Signatures - Traditional time signatures with Beats per bar and Beat value settings. Time Division - Modern alternative with Steps per beat and Beats per bar settings. FL Studio Mobile: Create and save complete multi-track music projects on your mobile Phone or Tablet (Android, iOS or Windows). Record, sequence, edit, mix and render complete songs. Music production everywhere, all the time! FL Studio Mobile 3.2.14 is now available for (Android, iOS or Windows). This update focuses on Time Stretching audio in the App. Audio Clips - New Sync function, when selected the Pitch and Duration of the clip can be adjusted independently. Clips - Content can be stretched (resized) in the respective editors. Make a selection and drag the lower handle as shown above. Exported songs and loops now contain embedded tempo data. FL Studio Mobile 3.2 is now available for (Android, iOS or Windows). 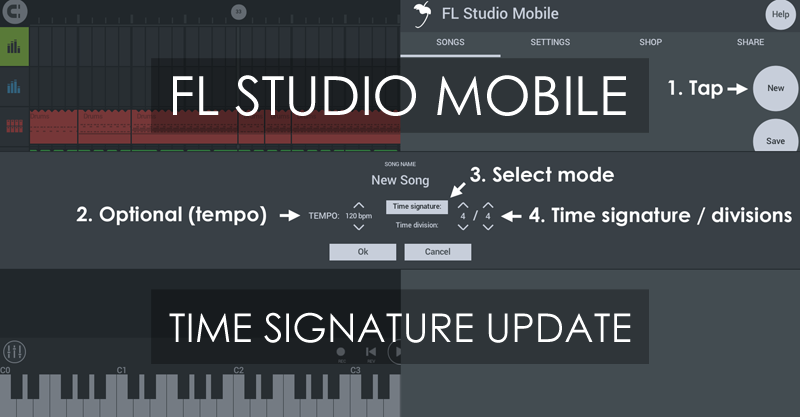 This update focuses on workflow improvements as requested by our customers on the FL Studio Mobile forum (tap Help > Users & Support Forum to access). We're also proud to announce FL Studio Mobile won DJ Magazines Best Music Production App award 2018! Audio Tracks - Level, Pan, Pitch, Reverse controls on lower Playlist. Use more than one sample per track. Clips - Can now be combined and muted. New Preview option plays currently selected clip only. Time selection menu - Insert/Delete time, Trim etc. Free samples - Minimal kicks x 55. Export - Rendering updated and simplified. Snapping - Micro automatic snapping (less than one step according to zoom). Play position - In editors now display only sounding notes.